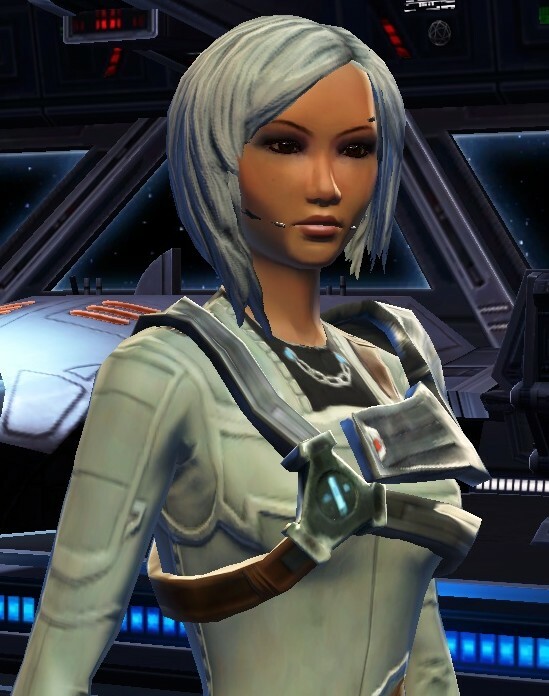 My current TOR character is an Imperial agent named Ixendra (I go back and forth between pronunciations: ih-SHENdra or ix-ENdra). She’s a humanoid cyborg, unrelated to my other previous characters. I designed her as kind of an Imperial version of Winter (hence the hair). Her cybernetic implants give her a major advantage in terms of memory and intelligence, and she excels at undercover work. When she is undercover, she commits herself the the role entirely–nothing is off-limits. Hence her “real” personality can be difficult to discover. She’s committed to the Empire and takes her job seriously (sometimes clashing with Kaliyo), but she does like to have fun. She uses every resource to complete her objectives, including her looks. She’s definitely an “ends justify the means” kinda girl; she obviously leans dark side, but I think of her more as chaotic neutral. Everybody says that Agent is the best storyline, and so far I agree. I’m into Chapter 2, and it just keeps getting better. Unfortunately, agents have some of the worst clothing options…ugly Imp jackets and capes. I love the white jacket Ixendra’s wearing in these shots, but it’s for low level and I can’t find anything similar for higher level. Previous Article Let’s get started, ready steady go!